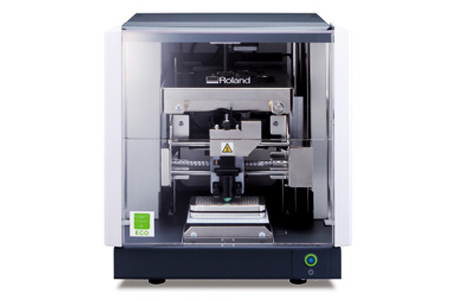 Roland is proud to announce the NEW Roland METAZA MPX-90 Photo Impact Printer. The Roland MPX-90 has raised the bar once again and is now suitable for semi-industrial levels of production on harder metals. While this is not necessarily a substitution for an engraving machine, the MPX-90 opens the door to companies who are looking for an easy to use and cost effective method for producing number plates and identification tags while still benefiting from the flexibility of being able to imprint photos on jewelry and gift items as well. Roland has done so by increasing the speed, power and versatility of the MPX-90 impact printer. The Roland MPX-90 photo impact printer is the 5th revision of our proven impact printer line and is a direct replacement of the Roland MPX-80. The Roland MPX-80 and Roland MPX-70 are no longer available. Read on for an in depth understanding of the latest features and improvements over the previous models. The Roland photo impact printers were designed for placement in the kiosk, gift and jewelry industries. The intended function of the METAZA impact printer was to imprint photos, text and logos on pendants, dog tags and various gift items. Contrary to engraving; the method used by the EGX models, the impact printers strike downwards with a cemented carbide tip, creating a slight indentation in the material. The harder the strike, the brighter the impression left behind. Remember the first dot-matrix computer printers that were introduced back in the old days? This method is similar; however, there is no ink used. This unique ability to imprint a gradation of tiny dots results in the smoothest transition between tones and the highest resolution possible out of any other method found on the market. This proves to be the most efficient and cost effective way to produce high resolution photos, images and text on soft metals. Initially, imprinting photos on jewelry and pendants was the main reason one would purchase an impact printer; that is, until now! The Roland MPX-90 is now 21% faster than the previous model when impact printing in vector mode, which yields its highest resolution of 1058 dpi. The striking pin has also been replaced with a diamond tipped stylus as opposed to the cemented carbide tips found in the previous models. With the incorporation of this new print head, it is estimated that the Roland MPX-90 can yield up to 7,000 pieces, which is almost twice the lifespan of the previous carbide print head. The print head is also user replaceable. 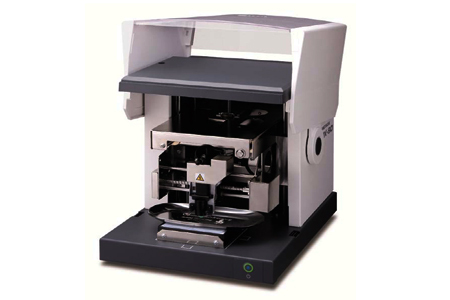 In addition, the MPX-90 impact printer strikes with three times the down force as that of its predecessor, the MPX-80. These features alone open the door to much more robust applications such as imprinting on non-plated/unpolished materials. With its new diamond stylus and impressive impact force, the Roland MPX-90 can imprint on a much wider variety of materials. The MPX-90 is now capable of impact printing stainless steel, iron, titanium, platinum and other materials up to 200 Vickers hardness, with much more clarity than ever before. This of course improves the quality of softer metals such as gold, silver, copper, nickel and aluminum as well. Furthermore, the MPX-90 incorporates the same Text (262 dpi), Photo (353 dpi), High Resolution (529 dpi) and Vector (1058 dpi) modes as before. With four different print modes to choose from, the Roland MPX-90 combines photos, text and vector images for attractive, everlasting results. The service provided by Jesse was excellent. The whole transaction from quote to purchase was very simple and a pleasure. Love the machine, have plenty of support from seller. Very satisfied. Working with Daniel was fantastic. They followed thru with everything they said they were going to do. Buying my MPX 90 printer was an easy process. They set me up and helped me get going with my engraving business. HIGHLY PROFESSIONAL! I would give them 2 thumbs up along with a 5 STAR rating! Keep up the good work! I have received great service with the mpx 90. The help was very satisfactory. Could not ask for better customer service. From purchase to after sale support. Jesse made sure that my order process went smoothly and called me after I received my Roland MPX-90 to be sure I was doing well learning the machine and software. Highly recommend Engraving Machine Plus. I will continue to do business with them.